The Jefferson County Courthouse in Beaumont. 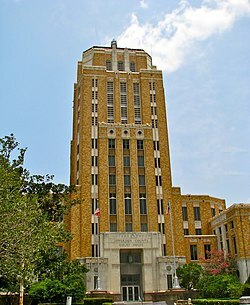 The Art Deco-style building was added to the National Register of Historic Places on June 17, 1982. The top five floors once served as the County Jail. Comitatul Jefferson (în engleză Jefferson County) este un comitat din statul Texas, Statele Unite ale Americii.